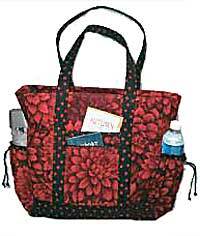 The Professional Tote Bag Pattern has all the compartments and pockets that today's professional woman needs with a pleated pocket on each side, a front zipper pocket and a large back pocket to just name a few. Finished size is 18" wide x 15" tall x 5" deep. 3 1/2 yds webbing/belting for handles OR 1 covered lightweight cotton webbing with fabric.